It is not clear that the prayer helps allay the fear of the dark and of death in the dark, but as children we learn it anyway. It is probably the first prayer that is learned. Its lesson is that, parent or child, we are hostage to fortune or His will. It is one of the most fundamental calisthenics of faith. Most children remain afraid of the dark but learn not to admit it. At some point you grow out of it. You become an adult and no longer a slave to childish fears without foundations. You tell yourself, “I’m not afraid of the dark.” You’re lying but, like so many other lies that let you get through the day, you lie so long that you forget it is what it is, a lie. I feared the dark as a child and when I grew to be a man I still felt uneasy when consigned to a room that was “too dark.” I developed some manly and not-so-manly methods for mitigating the dark -- light curtains, dim baseboard night lights in the hallway, falling asleep with the television on a timer, votive candles, the whole inventory. After some years of sleeping safe within these rituals and relics I forgot that I was, in the core of my being, still afraid of the dark; afraid that “I should die before I wake.” And then I did. The thing about dying and then being returned to life is that, like a ghost half-seen out of the corner of the eye or in a shadow on the stairs, the experience keeps coming back. You think you’ve pretty much exhausted what you think about it -- exhausted all there is to think about it -- and then you are presented with a new moment, a new cause for reflection. It appeared so vividly it was as if an alien, almost feminine, voice had recited it to my ears in that room. I lay there feeling anything but sleepy and thought about this prayer. I suppose that’s a way of making the poem fit for a more secular society in which nothing fatal ever happens to children. Until, of course, it does. But that’s for another, younger, and more clueless generation. I’m stuck with the original in my memory. At most times and in most places, this prayer was simply a tradition, not a reality. But I wasn’t in most times or in most places and it was terrifying. It was terrifying because, as it occured to me then, I had experienced the reality of the prayer. I had actually died before I could wake. I continued in death for some unknown minutes and then was revived and kept in a deathlike coma for 13 days; a time that I, gratefully, have no memory of whatsoever. And, it came to me, I had died in the bed I was currently lying down in and thinking of this old childhood prayer. I had, without realizing it, gotten used to sleeping in my deathbed. but I can’t. Like my first death, I don’t remember anything about those last moments, or the ones that came after. So I can’t say I said a prayer. I can only pray I did. This speaks to me. I learned the old prayer, too as a child, where we would have to say it on our knees beside the bed with hands together, pointed upward. And followed up with, "and God bless (all your siblings, parents, grandparents and the dog - but not the cat, because he was mean)." But I have been battling a fear of sleeping. For the last several years. It's only gotten worse, til I just get whacked at about 8. Maybe it's because I have a night job, or maybe it's other things. I just know that I hear this poem in my head all the time. Only it's my voice I hear reciting it. 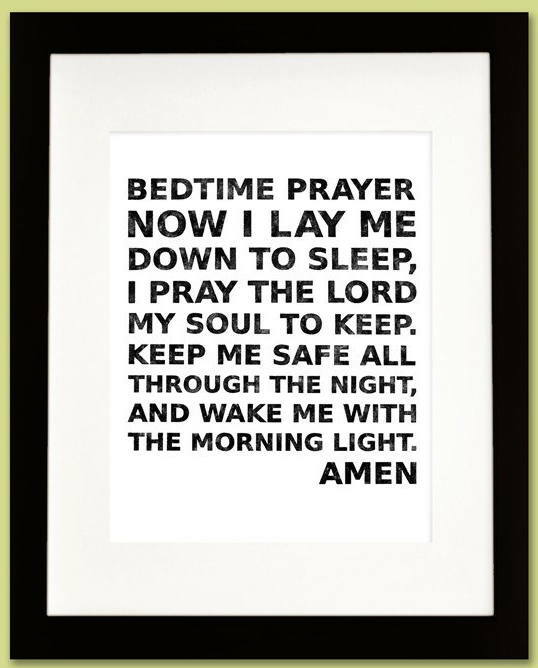 It was my father who put me to sleep at night and taught me to say my bedtime prayers, including "Now I lay me down to sleep," but I learned the longer version. Until today, I thought the first line was: Matthew, Mark, Luke, and John, hold the horse 'til I get on. Why, I wonder, did my Dad say it that way? Did he learn it like that in his childhood? Was he just being the joker he always was? I don't recall ever being afraid of the dark, but I was very afraid of the tigers under my bed ... I am sure an outgrowth of too many repeats of the children's book, "Little Black Sambo," who chased the tigers around the tree until they turned to butter. And, my other terror was the door to the attic that you accessed from my room. I was convinced that very scary things lived in the attic. It became a nightly ritual for my Daddy to check under the bed every night and to open the attic door and tell the "scary things" to go to sleep and not bother me. After that, he would sit on my bed and listen to my bedtime prayers. My parents didn't teach me this one; come to think of it, even though we were churchgoers I don't think we made a ritual of saying bedtime prayers. I first memorized it as a kid thanks to the movie Poltergeist (which played frequently in our house, thanks to my older sister), so whenever I read it I hear that little girl's haunted voice reciting it in my mind. I can understand why, back in the days of not-infrequent childhood death, a parent might want their child to learn this, and even find comfort in it. These days, given the great unlikelihood of any child dying in his sleep, it seems more an invitation to nightmares. As I've read the various posts you've written since your night of dying, it has been enlightening to see how this experience has been such a life changing event. I see you struggling to understand the fears and joys you go thru. Several times, I've wondered how the same type of event would impact me and always my first thought has been, "I would be terrified to go to sleep at night." You have made me realize how important it is to have my relationships in order each night, so that I do not lie down to left-over regrets, leave angry words behind, or not be right with God. God smiled on you in the form of quick response to bring you back, but He smiles on all of us thru you, and that is pretty darn special. There are countless versions, and I doubt any are 'the original'. None have ever seemed to speak for my wishes except this one. He's been a good dog,my best friend, right through it all. (The role of Hansel is usually sung by an adult mezzo-soprano). Gerard, that's some heavy story. Being an Aspy/wannabe engineer/geek type I deal with the fears and the future with preparation and analysis. I prepare for the worst, as best I can. I use some of my time to try and think deeply about those few big items which we all have to sort out and for which nobody can do it for you. I prefer to think of it as pre-planning the inevitable in calm so that when that time comes I don't have to try and figure it all out on the spot. Flying small planes for years is where I "perfected" my system. The idea is to know as much as possible about something, think it through, and practice being focused when it seems you are being overwhelmed. Few if any problems need an immediate and perfect response NOW. A moment to breathe and a retreat to The Plan is the best course of action. There aren't many things that every last one of us will face. But those things that will happen are best faced with forethought and relaxing. For me, I find the uncertainty and the surprise are what worry me as much as anything. So I see it as my job to find people that deal with certain things often, and use their insight to sort through the confusion. This method doesn't work for all. We each have to find our way through it. But there are centuries worth of thinking on whatever method works for you and it helps to have a tour guide of sorts. After a serious car wreck I found, for the first time in my life, an unconscious avoidance of wearing a seat belt in the car. The seat belt saved my and my passenger's lives. It took a while for me to decide I wanted to go through that pain, if it happened again, rather than accept the eternal flip of the switch. You're much appreciated by many. More than you know, no doubt. I was afraid of the dark and I had a ritual as a child before I could sleep. Had to check under the bed, the closet , it was like a pre flight check, or pre sleep check. Still cant sleep if a closet door is ajar, and I never, never sleep with my feet hanging exposed off the bed. Now in my early 50's, a family history of heart and cancer issues, it seems there is a new boogey man to worry about. That's a scouting report to the rest of us who will one day follow. Not many scouts return to give that story. I don't recall one who did it better. That's all right. I just prayed it for you. Go to sleep. Gerard, as I've only recently discovered your blog- I had no idea of your journey. You have been to far places, and have returned; maybe it's just as well that you have no memory of the place you dwelt for a time. I am so glad that you returned to dwell with us for a while longer! With regard to that poem- I too remember it from an early age, but have no recollection who taught it to me- it may have been my mother, but more likely one (or both) of my grandmothers, who were far more religious than my parents. My way of dealing with the "take my soul before I wake" was to realize that upon my death, my soul would go to Heaven; a place so marvellous and wonderful that everyone wants to end up there. As a child, my understanding was that just by saying the prayer I was guaranteed entry! The prayer also encourages us all to spend our lives doing good works and thinking good thoughts, since not everyone does go to Heaven upon their death; Heaven has a border, with angelic guards, and some are turned away and cannot enter. Those people are destined to go to another place with an eternally warmer climate. I am quite positive you are not one of those!